AFTER going through tough times, the team at Bill Robertson Toyota is celebrating some major accolades. 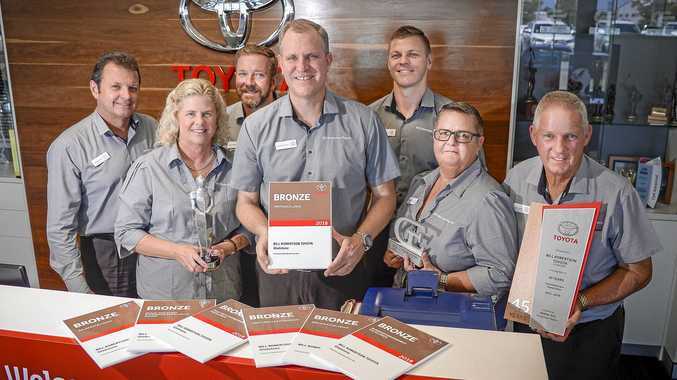 The business received nine gongs at the recent 2018 Dealer of the Year Awards event. These were for various departments, including sales, parts, business management and guest experience. Principal dealer James Robertson said the business had benefited last year from "a small recovery in the local economy”. "2017 for us was the worst year we had and 2018 was just a little better, not a lot better but ... that enabled us to reach the targets Toyota set for us,” Mr Robertson said. "The overall vehicle market in Gladstone was actually still down 0.5 of a per cent in 2018 from 2017 but we were able to increase our sales by 12 per cent. Mr Robertson said another contributing factor to the business's improvement was its team of stable and dedicated managers. He said 2017 was a challenging and stressful time for the Toyota dealer of 45 years. "It was really difficult, we had to cut a lot of expenses and we had to finish up some staff as well, which was very stressful and upsetting,” he said. Mr Robertson said since his parents started the family-run business, Bill Robertson Toyota prided itself on having relatively consistent management and believed this was a business advantage. "It just provides the stability and we're able to keep the knowledge that builds up over time about how to run the dealership efficiently and effectively,” he said. He thanked the public for its ongoing support. "We're grateful to the Gladstone people for supporting our business and enabling us to do our jobs and do them well,” Mr Robertson said.